Linux is present almost everywhere from cars to home appliances, smartphones and supercomputers. Virtually all super computers uses Linux. Its not just a coincidence that most of the Internet servers running on Linux operating system. Now the question comes in mind…. Before going into it further i am considering that you already know what an operating system is. Just like other operating systems OS X or iOS , Windows and Andriod , Linux is an operating system. It is a free version of UNIX . The free part here is not meant in money terms but rather that the source code for Linux is freely available for modification,inspection and what you feel you can do. has a reputation as a very efficient and fast-performing system. Linux is a multitask and multiuser operating system. This operating system provide both CLI and GUI mode. Lets dive more into this linux world…. Hardware layer – Hardware consists of all peripheral devices eg. RAM,HDD and CPU etc. System Library − These system libraries are special functions or programs using which application programs or system utilities accesses Kernel’s features. These libraries implement most of the functionalities of the operating system and do not requires kernel module’s code access rights. System Utility − System Utility programs are responsible to do specialized, individual level tasks. 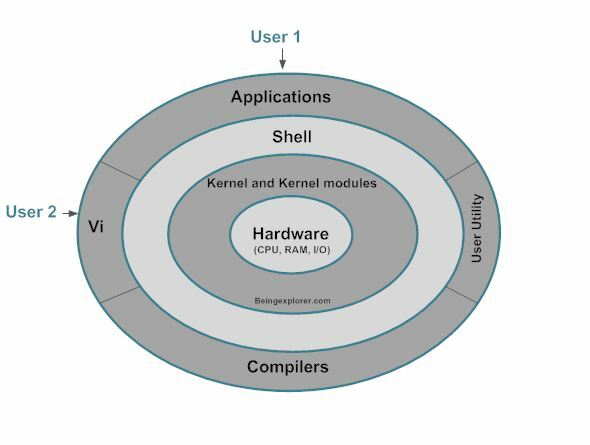 The Shell – You’ve probably heard of the Linux command line, well this is the shell – it is an interface between the user & the kernel, hiding the complexity(that you might dont wanna see) of the kernel’s functions from users. What it do is ,it takes command from user and executes kernel’s functions. Application Software – These are Utility programs giving user most of the functionality of an operating system. Users – System users, who intracts directly with the system and application softwares. To Clear the picture let me enlighten you about Linux distribution. Because sooner or later you will come across this term. Linux OS has a number of different versions(basically different kernel) to suit nearly any type of user. From beginner users to professional users, you can find a “flavor” of Linux to match your expectations. These different versions are called distributions. Get happy because nearly every distribution of Linux can be downloaded for free, and installed (on as many machines as you like). From my personal experience,Linux is the best OS platform one can have for server side. Usually it is only available in command line interface and believe me after working on CLI mode for a while ,you will find it comfortable to work on more than GUI.